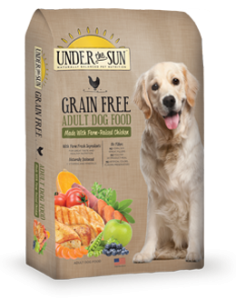 Under the Sun Grain Free or Original recipes for dogs are made with high quality pork meal for the protein base and farm-raised chicken or lamb, or fresh-caught salmon for great taste. We also add a bountiful harvest of farm-fresh fruits and veggies. We’ve included lots of good things grown under the sun in our new dog foods to provide your pet with all the great-tasting nutrition they deserve! Available in dry and canned formulas. Under the Sun Dog Food is available in dry and canned formulas. Stop by Lochte Feed and General Store in Fredericksburg, TX for all your pet food and supply needs. This entry was posted on Monday, February 6th, 2017 at 9:45 am	and is filed under News & Updates. You can follow any responses to this entry through the RSS 2.0 feed. Both comments and pings are currently closed.